Saudi Readymix has successfully supplied almost one million cubic meters of ready-mixed concrete to Lines 1 & 2 of the Riyadh Metro project. Concrete was delivered to the King Abdullah Financial District (KAFD) main station, deep underground stations and surface stations along with the blue and red metro lines that are being constructed by the Bechtel-Al Mabani-CCC Siemens, BACS consortium. 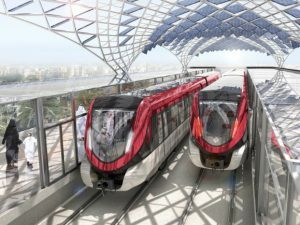 The Riyadh Metro project, which started in October 2013, is estimated to be completed in five years and will require a total investment of nearly 23 billion US Dollars. It consists of 6 metro lines spanning a total length of 176 kilometers, with 85 stations. It is expected to be the backbone of the capital’s public transport system.